Last week I took my mom to Washington DC to see the cherry blossoms and it was a very successful trip! I say that because not only did we see the cherry blossoms at peak bloom, but we were also able to get hundreds of shots without people in them! The only little disappointment was the weather; the sun didn't come out so it was cloudy. But to be honest, that didn't bother us at all, because at least it wasn't raining! Just so you know: This trip to DC wasn't easy to plan! My mom was flying into New York all the way from Taiwan for just two weeks before she dashes off to Los Angeles, so I didn't have a large window to make the trip happen. Thankfully though, DC is just a train ride away. Below, I've listed how I planned my trip for the cherry blossom watch this year. Hopefully, you'll find these tips helpful when you plan yours in the future, too! If there is only one thing you're doing to plan for the cherry blossom watch, then let it be checking out this website: https://cherryblossomwatch.com/. The website gives regular updates on the status of the cherry blossom trees (every two, three days on average), including peak bloom predictions made by the National Park service team. Originally, peak bloom was expected to take place between March 17 and 20, based on past records. But the temperature turned out to be lower than usual; it even snowed at one point! Thankfully, the snow wasn't a threat to the cherry blossoms. The peak bloom period was simply pushed back by a few weeks to April 8 - 12. Once I saw the announcement of the revised peak bloom prediction, which was about three weeks prior to the actual predicted dates, I went ahead and immediately booked train tickets and a hotel room for one night. The prices were only going to go up, so don't wait! My mom landed in JFK on April 10, and we took the 11 a.m. train from Penn Station the following day. She was tired, but she thought it was totally worth it! Yes, I know you have work, but trust me: a trip to DC for the cherry blossoms is worthy of a day or two vacation days! There are cherry blossom trees in parts of Central Park and in Brooklyn, too, but I think it really is a different experience! 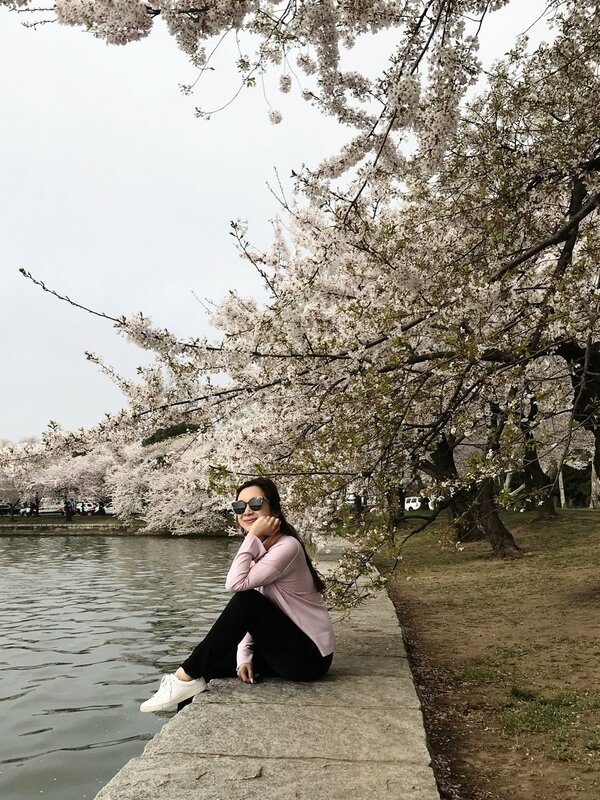 DC is extremely crowded on the weekends in March and April because of the cherry blossoms, so in order to avoid busy times, traveling on a weekday is the best approach. Okay, if you really can't or don't want to use your vacation days, then wake up early and plan your visit in the morning. My mom and I arrived in DC Wednesday afternoon but waited until Thursday morning to go see the cherry blossoms (this was why I decided to stay overnight). We left our hotel right after breakfast around 8:30 a.m. and the timing was perfect. We only saw a handful of people, and were able to sit on a bench to enjoy the peaceful, romantic scenery. There are cherry blossom trees planted throughout the city; we saw a lot especially near iconic landmarks and tourist sites. But I asked around and everyone agreed the best place to see all the cherry blossom trees is undoubtedly at Tidal Basin. Because Tidal Basin was the main focus, I picked a hotel that was located within walking distance. This was extra helpful in the morning because rush hour didn't affect us, and we were able to get to Tidal Basin after a relaxing 20-minute stroll. This is not something necessary but I like to plan my outfits too when I travel (hehe). I purposely packed a soft blush/lavender-ish sweater from Naadam so the overall color theme is in unison with the light pink cherry blossoms. Maybe this is something you can keep in mind as well! Tips on how to enjoy Copenhagen without breaking the bank. Plus, a video featuring Top Copenhagen spots! Find out how Tricia manages her combination skin when she is on the plane! This is how I get quality earrings and avoid buying overpriced jewelry! Tips to becoming the #bestdressed as as wedding guest!